On 2nd May 1884 the foundation stone of the North Board school was laid by W. Jeaffreson, Chairman of the School Board and the building was completed by November of the same year. Honourable A.J. Mundella, as guest of honour. When completed the school was to have accommodated 700 children, 200 boys, 200 girls and 300 infants. The Headteacher was Mr David Luck and Mr Thomas Mummery was Head of boys, with Mrs Bird being Head of girls and Mrs Funnell Head of infants. When the school opened the number on roll was actually 168 boys, 127 girls and 126 infants, making a total of 421. This gradually rose until late 1885 when it reached more than 650 children. The name of the school changed twice more. In 1902 it became known as the North Council school and in January 1928 when the school was merged with Sidney Street Council school (now known as Castlehill Community school). It was re-named Mundella Council School in honour of A.J. Mundella M.P. When the 2 schools merged the boys went to Sidney Street and the girls stayed at Mundella. Walter Tull was born at 16 Allendale Street in Folkestone on 28th April 1888. His grandfather was a slave in Barbados. His father, came to Britain in 1876 and married a girl in Folkestone and they had six children. Walter attended the North Board school (now Mundella Primary school) and when both parents died was taken into care in London. He went on to become the first black outfield professional football player. He signed for Tottenham Hotspur in 1909 and then Northampton Town football club. He joined the army at the outbreak of WW1 and took part in the Battle of the Somme. He was the first black officer in the British army and was killed in action on 25th May 1918. His name is inscribed on the war memorial at the top of the Road of Remembrance, in Folkestone. We are proud of our links to Walter and were thrilled to be included in a news feature for Meridian Television to remember the centenary of his death in 2018. 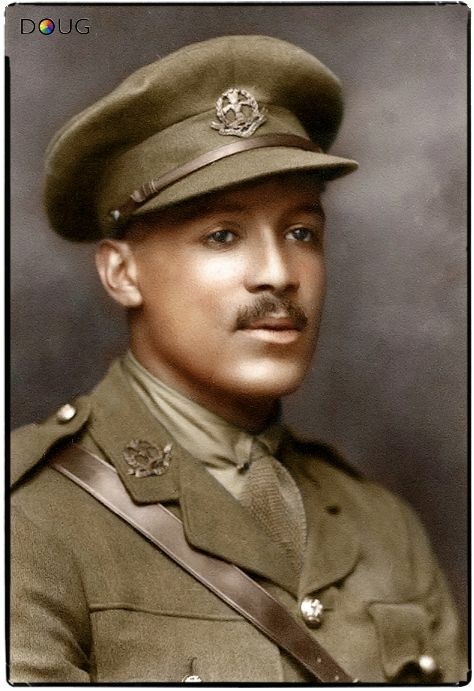 Please follow these links to find out more about Walter Tull. An Exhibition was held at The Grand Hotel Folkestone and they produced this useful information leaflet. (28 March 1825 – 21 July 1897) A.J. was an English manufacturer, reformer and Liberal Party politician who sat in the House of Commons from 1868 to 1897. Mundella was elected as Member of Parliament for Sheffield in the 1868 general election. Mundella was born in Leicester, the son of Antonio Mundella, an Italian refugee and his wife Rebecca Allsop of Leicester. He worked in the hosiery trade and became a partner in the firm of Hine and Mundella, manufacturers of Nottingham, Loughborough, and elsewhere. He was Sheriff of Nottingham in 1852. In 1859 Mundella originated and organised the first Courts of Conciliation and Arbitration to settle disputes between capital and labour. He was a Justice of the Peace for Middlesex and for Nottingham Borough and was an Alderman, President of the Chamber of Commerce, and president of the Board of Arbitration for Nottingham. Having made a close study of the educational systems of Germany and Switzerland, Mundella was an early advocate of compulsory education in England. He rendered valuable service in connexion with the Elementary Education Act of 1870, and the educational code of 1882, which became known as the "Mundella Code," marked a new departure in the regulation of public elementary schools and the conditions of the Government grants.